My name is Julene Fast and I have been enjoying making quilts for 30+ years. 32 years ago I moved from Manitoba to Southern Ontario and began attending Hawkesville Mennonite Church. It is situated in a small village not far from Kitchener. This small rural church has become part of my very core being as I have connected with the people that make up this body over many decades of life. Quilting was one of the areas at Hawkesville where I first began to feel this connection. The women that welcomed me and were thrilled when I showed an interest in quilting and being part of the sewing circle group gave me a place to begin the long slow process of feeling at home in this part of Canada. They were the first to delight in my creations in the quilt world and were always glad to admire when I brought another show and tell item. I have had a lot of fun and joy in coordinating our group's quilt contributions for the annual Mennonite relief sale in New Hamburg. Together we have created many quilts that have been sold at the sale. Our little church, along with other rural churches, has had discussions about our size, our future and how church is different than it was 50 years ago. I have never though, experienced a decline in the love and compassion that is shown each other in all our varied life experiences. I wondered if an idea for a quilt creation would be possible for our group of quilt piecers. I had put the idea aside believing that it might just be too difficult. However, we got asked if we would make a feature quilt for the sale and it seemed like I needed to pull that idea back onto the table. I wanted to make a picture of Hawkesville Mennonite Church using small squares. Sort of like a giant puzzle. A few trusted women assured me that it was an exciting prospect and with that confidence I set about designing and planning the making of this quilt. It was daunting but the absolute thrill I experienced as I observed about 20 of us putting together this giant puzzle, picking pieces out of about 10,000 2" squares that had been precut from our stashes of fabric, was all worth it. There are about 3000 pieces in this quilt. I asked Pix Martin to quilt this quilt as she has quilted many of my quilts over the years. The job she did completely astounded all of us at Hawkesville. It is exquisite. This creation is dedicated to Hawkesville Mennonite Church - all who have ever called it home and all those who might yet do that one day. You are beautiful. "Three Pieces in a Pod"
Doris, Maribeth and Pix's friendship stretches back 3 decades, sharing a passion for sewing. For 2 of these decades we have landed at Maribeth's parents, Paul and Beth Good, in New Hamburg for a weekend of creating whatever our sewing machines would produce. Our gracious host Paul, who took the opportunity to go long haul trucking, in the early years and now enjoys car dreaming and Beth along with Beth's sister Joanne regaled us with stories past and present while delighting us with scrumptious food, goodies and Paul's famous popcorn to keep us up sewing till the wee hours of the night! This is where our desire to make a quilt for the MCC Relief Sale started. Beth would pick the pattern and give us only the fabric requirements beforehand and Friday night, she would present the pattern and the task of creating the Relief Sale quilt top began. No one went to bed till the top was done. Our first quilt had over 3,000 pieces and took us till 5 a.m. to complete the top. The feature quilt, "Three Pieces in a Pod" is our "In Good Company VI" quilt. With the news of having the honour to create the feature quilt for 2018 we had to break tradition. 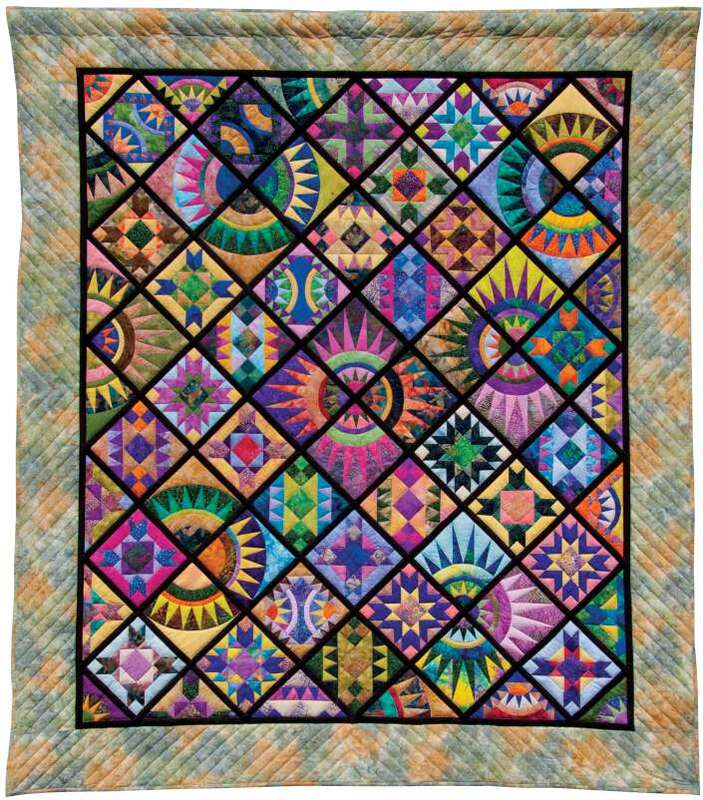 We wanted a unique, one of a kind piece that reflected our friendship and love of quilt-making - more time was required than one night. We landed at a favourite quilt shop, E&E Cloth and Creations, Newton, embarking on our fabric choices. Personally, we picked 3-4 favourite fabrics and one neutral jelly roll. We divided all the fabrics between us and started dreaming what blocks we could make. Deadlines were a must - we would come together and start arranging our blocks into our quilt. A weekend away together at a quilt show inspired our center medallion. The quilt features our love, the sewing machine, from appliqué, to embroidery to piecing and quilting. However, look closely and you will find hand appliqué! All our quilts are lovingly bound by hand, by our retreat hostess, Beth Good. We dedicate this quilt "Three Pieces in a Pod" to Joanne Hunsburger, Maribeth's Aunt who now resides at Nithview Nursing Home. In our first years of retreating at the Good's, Joanne and Beth offered us a non-stop commentary - we affectionately referred to them as the "Couch People". Joanne and Beth's generous spirits, baby bibs, double receiving blankets, crib quilts and throws for family and friends, were some of their passion and started us on the path to also give. We miss you Joanne! This stunning quilt was made with the 50th Annual Sale in mind. The donors wanted to make something “special” to mark the milestone. And it is special indeed. So special. in fact, that their permission was asked to save it to be the feature quilt for the 2017 Relief Sale. Thank you Heather Weitzel, Deb Stewart and Jennifer Schumm for this gorgeous quilt. The 50th Annual Relief Sale is an event to celebrate. Local quilter Emily Hunsberger offered to design a quilt to commemorate this milestone. It is significant that it is a group effort. For 50 years the auction has been a cooperative event with generous contributions from donors, organization by quilt committees, many volunteers at each auction, and enthusiastic auctioneers. All of course, with the hope of luring eager buyers! Emily carefully wrote up instructions for the assorted blocks and distributed them on the New Hamburg Mennonite Relief Sale website to interested people.The blocks chosen for this project were drawn from a booklet published in 1977 by the quilt committee at that time. In this manner, the past and future were connected. Before long beautiful blocks began to arrive from local donors and from as far away as B.C., Quebec. and P.E.I. So many blocks trickled in that there were enough to create the feature quilt and 3 smaller quilts that will also be auctioned. With the first quilt, Emily assembled the blocks, friends helped hand appliqué the flowers, hand quilt, and hem the binding. It was truly a cooperative effort. The 3 bonus quilts were assembled and quilted by Emily, with a volunteer hemming the bindings. Africa has long held a fascination for the rest of the world. From expansive desert to dense rainforest, from breath-taking mountains to waterfalls to broad plains, from rich, bustling seaports to tiny, nearly forgotten villages, Africa is truly a beautiful and multifaceted continent. Sadly, it is also home to war, famine, poverty and disease. This quilt is both a tribute to the beauty of Africa and an expression of the desire to do more to address the suffering of the people. The inspiration for the quilt arose after quilt coordinator Renske Helmuth travelled to Africa with her husband on a learning tour with the Canadian Food Grains Bank and the Mennonite Central Committee. Renske returned home with a collection of African fabrics and beads and her mind brimming over with memories of her trip. Before long she began to imagine capturing some of her memories in quilt form....and the idea for a group quilt project was born. When she introduced the idea of an African-themed quilt to the other quilters at her guild, Waterloo County Quilters Guild,she soon discovered that many of her fellow quilters had connections to Africa as well. Some had travelled there themselves, or had friends or relatives who had worked in Africa as part of a mission group. Others had an involvement with Omas-Siskona, a local branch of the Stephen Lewis Foundation’s Grandmothers campaign, which supports African grandmothers who are struggling to raise grandchildren orphaned by the AIDS epidemic. All women who participated in this quilt shared a desire to celebrate the beauty of Africa while reaching out to Africans in need. The blocks in this quilt were individually created and quilted, then joined together in a compelling mosaic that captures a glimpse of life in Africa-its people, its traditions, its landscape. Many authentic African fabrics, beads and buttons have been incorporated and participants used a wide variety of techniques, including piecing, appliqué and embellishment. The blocks are as colorful and diverse as Africa itself and love and hope have gone into every stitch. The women who created this quilt send it out into the world with the hope that, one day, Africa’s suffering will end, and that all will remain will be its beauty. Quilt size: 99 x 114"
Even though Minerva Knorr is a busy mother of three young children, she finds time to piece quilts, run a quilt shop and teach lessons. This is a natural extension of her love of quilting which she has done for fourteen years. Minerva chose the pattern for this beautiful medallion quilt because she likes earth tones, had lots of scraps and likes to create something interesting. Sometimes she is influenced by designs she would like to teach and this also helps stretch her comfort zone. She carries a variety of cotton fabrics and patterns for her quilt shop as well as kits and sewing and embroidery machines. She credits her husband Vernon and their two knowledgeable staff for helping to keep the shop running smoothly. The shop is called “Creekbank Sewing Machine Shop” and is located in the Conn area. Minerva often does her personal sewing between Christmas and New Years and chooses fabrics which help chase away the “winter blues”. She is already thinking about the quilt she would like to make for next year’s sale. Quilt size: 79 x 64"
At the 2010 Relief Sale, quilt #125 was a lovely appliqué bed quilt called "Rose Garden" donated by the Breslau Mennonite Church Creative Hands group. 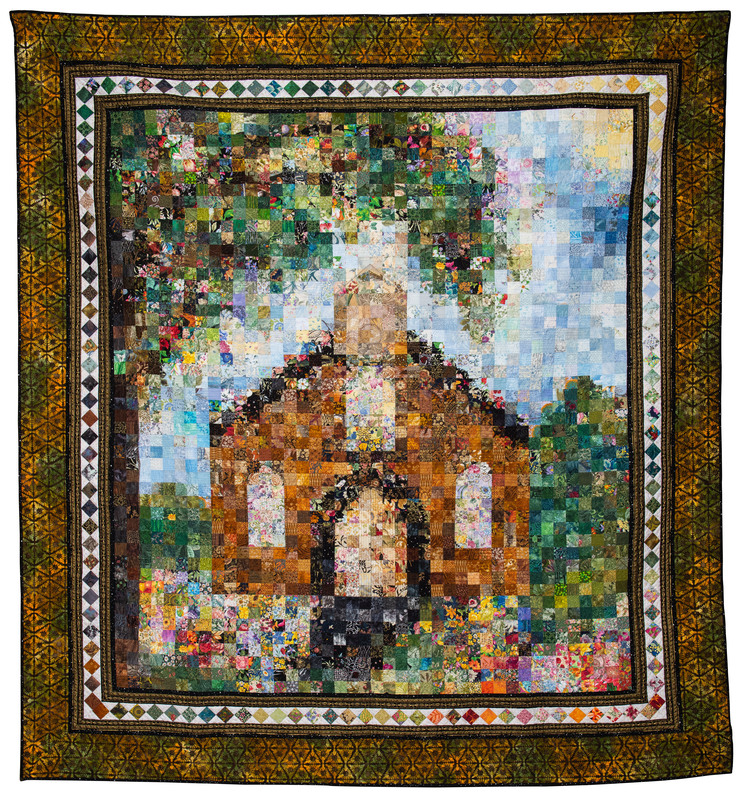 "Straightening the Rose Garden" was inspired by a photograph taken of this quilt from behind the stage as it was being readied for the auction. The appliqué motifs of the original quilt are visible in the machine quilting, if you look closely. "Straightening the Rose Garden" is appliquéd, mostly by hand. It is machine quilted, thread painted and enhanced with small bits of pencil crayon and fabric paint. Many of the fabrics were hand-dyed to create the appearance of shadows. Many thanks to photographer Jeff Schmidt for taking and sharing the photograph, to Yvonne Horst and Lori Diefenbacher for their kind permission to be recreated in fabric, and to the quilters from Breslau Mennonite church for their beautiful "Rose Garden" quilt. Quilt size: 89" x 104"
The 2012 feature quilt is the work of a dozen or so women, members of Ottawa Mennonite Church. These people represent a wide range of ages and sewing experience but with the guidance provided by leader, Marj Kaethler, they have developed a common interest in quilting. They began by working on comforters for MCC. Only one quilted project- a wallhanging designed by a member of the group had been completed when Marj supplied a variety of books and suggested they choose a design to donate to the relief sale auction. Enthusiasm for the project was high as they dove into Marj's sizable collection of batik fabrics. Even at that stage, there was talk of attending the sale to see the quilt sold. During work sessions, the group sometimes seemed to be the "happy rippers". Gradually, though, completed blocks emerged and this bright, colourful quilt came together. Although it was donated in 2011, it was decided that it would become the 2012 feature quilt. The group postponed plans for a visit to New Hamburg and have recently begun another relief sale quilt! Look for it in 2014! Quilt size: 96" x 96"
“Plain and Fancy” is a group quilt coordinated by Renske Helmuth. The design was inspired by Elly Sienkiewicz’s book “Papercuts and Plenty”. It is machine pieced, hand appliquéd and hand quilted. The dimensions are 96” X 96". A beautiful collection of batik fabrics was used. In September 2008 Renske presented her vision to the Waterloo County Quilter’s Guild. If enough interest was shown in the project, she would offer needle turn appliqué workshops. 66 members ranging in ability from beginner to advanced signed up. The workshops were held in January 2009. 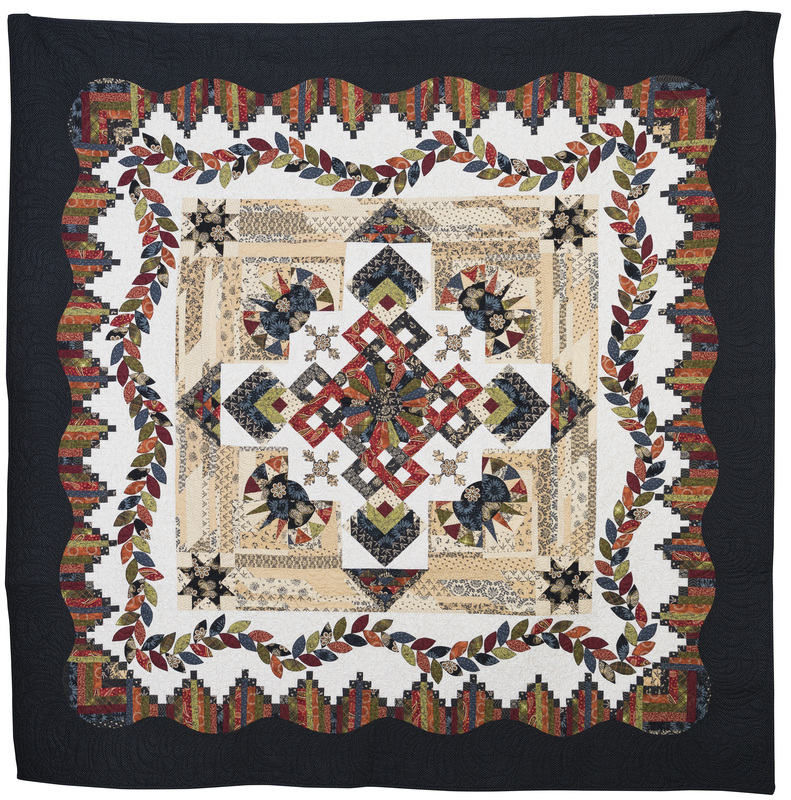 Enough blocks were returned to complete two quilts, “Plain and Fancy”, also a smaller wallhanging which was auctioned at the 2010 New Hamburg Mennonite Relief Sale. After the hand quilting and binding were complete , it was sent to Quilt Canada in Calgary where it won Honourable Mention in the bed quilt category. “Plain and Fancy” is a stunning example of Renske’s creativity and her ability to inspire, organise and coordinate a group of quilters. In all, over 100 quilters participated in this effort. Thanks again Renske for your inspiration and leadership. Quilt size: 90" x 100"
Due to popular demand for a new pattern, Emily Hunsberger went to her drawing board and came up with a versatile design that is quilted and assembled block by block. Traditional quilts are made by layering a whole quilt top with full-sized batting and backing. With the “quilt-as-you-go” method, small units are individually quilted, then joined together. Once joined, the only remaining step is to attach the binding. It is a very liberating experience. The central blocks in this pattern are “crazy-patch, log-cabin” style flowers. An irregular-shaped centre piece is surrounded by irregular strips which are added one at a time in a clockwise pattern. “Sew and flip” is another term for this method. The flower blocks are surrounded by a calmer section of appliquéd vines, leaves, and a splash of yo-yo flowers. The vines are separately made corner blocks. Next comes a border of log cabin blocks made using strips of varying widths, and are not the usual half-light, half-dark log cabins. An outer border of sew and flip “piano keys” finishes off the quilt. Emily loves scrap quilts, and encourages quilters to get serious about whittling down their ever-expanding “stashes” – that is, hoarded fabric. Every quilt is guaranteed to be one-of-a-kind! Emily has created a step-by-step pattern to share with you. Patterns are $5.00, with proceeds going to Mennonite Central Committee. The Postcard Quilt, the 2009 feature quilt, is extraordinary in design, colour, and ingenuity. Renske Helmuth of Moorefield, Ontario, again galvanized the quilters of the Waterloo County Quilters Guild to help realize her vision for an MCC-themed quilt, the work of many hands. Members made 4x6 fabric postcards which portrayed some aspect of MCC's mission work. 80 of these creations were sent by MCC, enclosed in envelopes, to their workers around the world. The MCC workers who received them wrote short notes on the fabric and returned them by regular post to MCC in Kitchener. Each of the 50 returned postcards had an intriguing return address and a colourful postage stamp from the country of origin. Renske had a plan to incorporate these postcards into a quilt or large wall-hanging, where both the fronts and backs of the postcards could be viewed and the messages read. The central part of the quilt, created in shades of blue, is the traditional "Trip Around the World" pattern with an appliqued map of the world. The names of the international cities from which the postcards were mailed are embroidered on the map. Mariner's compasses, some with the MCC dove logo at their centre, outline the border. Hand-quilting completes this incredibly inventive and imaginative masterpiece. This exquisitely cross-stitched quilt was created by Myrtle Horst while she was recuperating from surgery. Myrtle said, “It took about a year to complete and was a good pastime.” This complicated pattern has six different shades of pink and six different shades of green. The overall effect is truly stunning. Since 1995, this 86 year old woman has donated 15 quilts to the New Hamburg Mennonite Relief Sale raising $39,325.00 so far. She said, “I had no idea the quilts would raise that amount of money. I am thankful to the Lord for good eyesight, and that I can help other people by making quilts.” Myrtle already has two more quilts cross-stitched ready to be quilted for the 2009 relief sale. Blossom Bowman Zink adapted a traditional pattern to create this artistic masterpiece. All triangles were cut individually and sewn together with painstaking accuracy. Blossom Bowman Zink, who learned the quilting craft from her mother, Vernice Bowman, has been piecing quilts for 35 years. Since there are so many patterns Blossom would like to try, she makes a lot of miniature quilts. Most of the full-size quilts Blossom makes are donated to charity auctions. This quilting pass-time is in addition to her fulltime job outside her home. From earliest times, humans have gazed into the sky, watching birds swoop and circle, and have envied their gift of flight. How exhilarating to soar through the kingdom of the clouds! What a different view of earth a bird must have, gazing down on us from the heavens! Photographer Carl Hiebert has explored the freedom and majesty of the skies in his ultralight plane, and his camera has captured the bird’s perspective of our lives: a view unique to those who are airborne. A tree’s bark, or even its height, is irrelevant from above. The bird sees the tree’s crown as a splash of colour, highlighted and shadowed by the sun; in winter, empty gnarled branches splay against the snow like spider legs. Airborne observers see not the grain, but undulating fields of gold and green; not waves, but the river snaking through the valley; not asphalt, but the criss-crossing of our roadways. And what do birds think when they see humans in the sky, in hot-air balloons and gliders? Our quilt interprets 27 of Carl Hiebert’s aerial photographs, celebrating the bird’s eye view of life along - and in the sky above - the Grand River. I was watching the news on TV one night, wishing I could do something to help some of the sick and starving children in Africa. Then I remembered Lois Weber, the wonderful Mennonite friend that I had made when I had lived in Elmira for eight years. Lois, a kind and unselfish neighbour who influenced me in many ways, has a great love of gardening. Since my quilt has many flowers I thought to name it after her and donate it to the Ontario Mennonite Relief Sale and Quilt Auction, her very worthy cause. The 2003 featured quilt was designed to celebrate friendship and understanding. It is truly a miracle when our humanity is revealed in respect for the many different people of this worlkd. We need images of a world drawn together to insipre our commitment to peace. Many hands created Kaleidoscope of Nations, a work of art and beauty which represents the unity of all nations. At the request of Renske Helmuth, the creator of the design, fabrics from 40 countries were collected from MCC relief workers: bark cloth from Uganda, silk from Bangladesh, damask from Ireland and aribou hide from Labrador. Members of the Waterloo County Quilters' Guild fashioned the dolls in traditional costume and travelled to Listowel to help the women of Listowel Mennonite church with the quilting. Altogether, 70 women were involved. 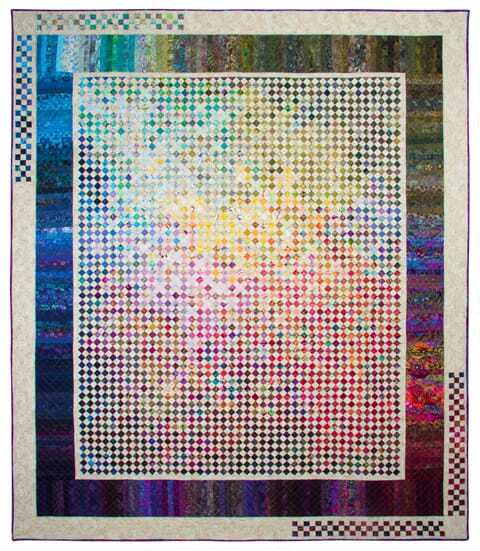 The quilt was voted Best Group Quilt and received a Viewers Choice award at the Ontario Juried Quilt show in May 2002.